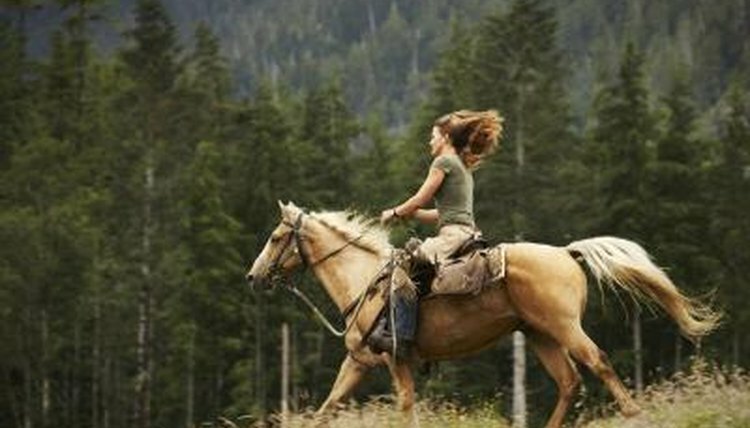 Horses canter on either the left or right lead. In the right lead canter, the right foreleg extends further out or "leads" the rest of the footfalls in the three-beat gait. When horses are cantering at liberty, either a left or right lead canter is acceptable. When you're riding in an arena, it's important to pick up the correct lead for the direction in which your horse is traveling so that he is balanced and doesn't stumble. The right lead is used when horses travel on a circle in a clockwise direction. If your horse won't pick up the right lead, practice basic exercises to ensure that he's responding well to your aids at the walk and trot. Practice the walk, posting and sitting trot on the center line, riding as straight a line as you possible can. Practice canter departures on the left lead, making sure that you are sitting straight without tipping to one side, leaning forward or jerking on the reins, all of which can cue the horse into the wrong lead. Once you're sure that your horse is responding to basic aids at the walk, trot and left lead canter, practice other exercises to encourage your horse to pick up a right lead canter. Practicing leg yields at the walk and trot helps your horse develop the suppleness and balance he needs to pick up the correct lead. Sit up straight and centered in the saddle. Walk your horse along the arena rail in a clockwise direction. Shift your weight slightly to the inside seat bone. Bring your outside leg slightly behind the girth. Squeeze gently with your inside leg to push your horse's body to the outside rail, while simultaneously bringing the inside rein back so that the horse's head is turned slightly to the inside. He should move forward with a slight bend or curve around your inside leg. Another exercise to help your horse learn the right lead is to practice the leg yield on a clockwise circle. This slight bend to the inside of the circle is preparation for the right lead canter. Practice circles in both directions to ensure your horse doesn't strain one side of his body by over practicing in one direction. Walk and trot 20 meter circles, changing direction frequently to ensure your horse is listening to your aids. Practice the right lead canter departure until your horse picks up the right lead. Warm up your horse at the walk and trot in both directions, and at the left lead canter in a counterclockwise direction. Return to a trot and change direction across the center line. As the horse approaches a corner of the riding arena, shift your weight to the inside, bring the right rein back slightly, and bring your outside leg behind the girth to cue the canter. If you carry a riding crop, carry it in your outside hand and tap the horse gently behind the outside girth to reinforce your leg aids. Once your horse picks up the right lead, praise him and pat him on the neck, asking him to continue cantering at least once around the arena before returning to a walk. Jane Savoie: Canter Your Dressage Horse on the Correct Lead Every Time!